It will be showed at the Oss fair tomorrow, but you can already download the new version of openMSX right now. 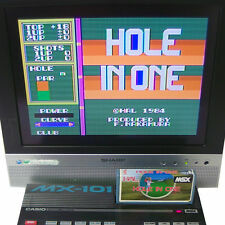 The main new feature is video scaling, which scales the low-res MSX screen to a high-res PC screen taking edges into account. No more blocky pixels! The following algorithms are available: Scale2x, 2xSaI and hq2x. For screenshots, see our home page or msx.vampier.net. Also new is the control protocol. It's still experimental, but it will play a very important role in the future. Using this protocol, an external process can control openMSX by sending commands, just like you can do from the console. Programs like a GUI or a debugger can use this to communicate with a running openMSX session. Soon there will be an all-new openMSX Catapult which uses this protocol, making it more than just a launcher. If you come to Oss, visit us and see the new Catapult in action. Several fixes in VDP emulation; more games and demos work correctly. Use "set scaler <name>" to select a scaler. Scanlines now work in SDLHi (previously, they only worked in SDLGL). Per-pixel alpha blending for console on SDLHi/SDLLo. This makes anti-aliased console fonts look better. - Fixed slowdowns in fullscreen mode. Switched to Jarek Burczynski's YM2413 core (MSX-MUSIC). Added high-pass IIR filter to mixer to avoid audio clipping. Added I/O device multiplexing: you can now safely insert an FM-PAC in an MSX turbo R, for example. Added screenshot feature. Default key bindings changed to put this under PrtScr. F12 toggles full screen now, while Quit is not mapped anymore, by default. Added Ren-Sha Turbo (autofire) emulation: "set renshaturbo <speed>". Added emulation of the MSX turbo R pause key. Added LED status of disk drives. Fixed harddisk image creation: automatically create or enlarge hd-image when the specified file doesn't exist or is too small. "Enum settings" are now case insensitive, i.e. you can use SDLHi, sdlhi, or SdLhI now, if you mean the SDLHi renderer. Added a 'boosted' MSX2 configuration: a fantasy machine with lots of internal hardware. More of these will be added in future releases. The current configuration is still experimental; feedback is welcome. Added alternative build system ("alternative.mk"), which is more flexible and easier to maintain than the old system which uses GNU's auto* tools ("configure" and friends). The alternative system will replace the auto* system in the future, so please test it on your machine and report any problems. You can use it with "make -f alternative.mk" to compile and "make -f alternative.mk install" to install. Added support for Intel's ICC 8.0 compiler (only in alternative.mk). Added experimental support for Mac OS X (only in alternative.mk). Thanks to Jan Lukens (Jalu) for testing/debugging this. Dropped support for GCC 2.95 (please upgrade to GCC 3.x). Added the ability to control openMSX from an external process (launcher, debugger) using an XML-based control protocol. This is an experimental feature; the control protocol will change incompatibly in the next release. For an example client implementation, see Contrib/openmsx-control.cc. We're working on a new openMSX Catapult which uses this protocol. - renderer "none", which displays nothing. - "power" setting: enable or disable power to the MSX machine. - "restoredefault" command: restores a setting to the value specified in settings.xml. - "info" command: gets info such as lists of pluggables, renderers etc. - "keymatrixup"/"keymatrixdown" commands: manipulate the keyboard matrix. Added a debugger interface, accessible through the "debug" command. The following devices currently support this interface: CPU, I/O ports, memory, VDP and VRAM. Also it is possible to set breakpoints. Small improvements in debug device. 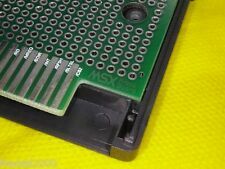 The debug device is very useful for people developing MSX software in openMSX; read the manual for details. Added "vdpcmdtrace" setting: enable or disable VDP command tracing. Well, as long as it doesn't hurt anyone . nice! I'll see if I can make good use of the debugging features! Even without an external debugger, being able to set/read VDP registers etc from the console is already a big step forward. Well, the openMSX developers will be happy to hear what you guys have been doing with these features! Also: ideas for improving them are always welcome, of course.